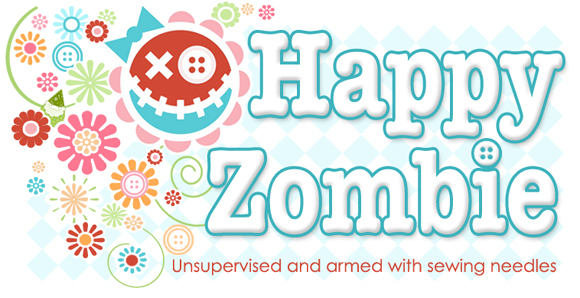 Happy Zombie » Blog Archive » Cotton Floss book tour & give-away! Cotton Floss book tour & give-away! I am so excited and so honored to be kicking off the Cotton Floss book tour! Cotton Floss is a brand new stitchery, quilting and sewing book by my dear friend Natalie Lymer of Cinderberry Stitches. It is freaking amazing! So cute you’ll be weeping on all your pages. I’m so thrilled about Cotton Floss - it’s as if Natalie set out to create everything in the book just for me. Natalie has some other great news, but I’ll let my new sister share that. This is Natalie. ISNT SHE CUTE! And look at her adorable space where she gives birth to all that cuteness (like Flat Nat - who traveled to me all the way from Australia and now makes her home in my studio!). Shroomy love - I’m soooo going to make those! There’s sooo much stuff in Cotton Floss that I want to make, and so many more of Natalie’s beautiful photos I want to show… but I have to not be greedy and let the others on the blog tour be able to use them, too. And the others tour members are like a stitch-n-laugh sleep-over dream team! Seriously, I want to have a slumber party with all of them!! and finally some stitching in the truck while Hub’s was driving - and not finishing it because it got dark. (Dear Oregon, more street lights, please). And finally the giveaway! Natalie so kindly gave me a copy of Cotton Floss to give to one lucky winner. I thought I’d throw in a little charm pack of Happy Mochi Yum Yum in case the winner wants to make a Flat Nat quilt too (maybe there’s someone small and flat in their life, too). To enter, please leave a comment by noon Thursday (PST) on 6/16, and I’ll have random.org draw a number/winner! Everything Nat does is amazing! Even if I can’t win this in the blog tour I’ll have to buy it! Looks like such fun projects! I’d love to win! Common random number thingy.. Please pick me. I LOVE the book and I will just die to get me some YUM YUM! Wow, I have to have that book! Natalie is such a gorgeous lady I was so excited when I found out she was writing a book. Oh my word! How adorable are the shrooms?? Have some space on my mantle just for a bunch of them! And Happy Mochi is YUM! That looks like a fantastic book. One that I really really need. Ohhh I wonder if I could ever be so lucky as to win this gorgeous book ? Nats work is amazing I love her whimsical images! 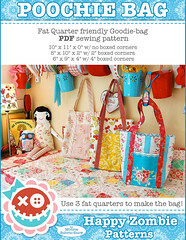 Love Natalie’s designs and your yummy new fabric too. oh wow! what a wonderful giveaway! What a wonderful book and a great giveaway! I love Natalie’s creativeness… especially Flat Nat! Her book looks lovely too. Oh WOW - this book looks just darling - would love to win a copy! love the fabric you have used and how beautiful are those cosmo threads to use? my new favourite thing! Awwww, you are right! So much sweetness and even Nat is a sweetie - what more could we expect! I would love, love, love to have so much cuteness in my hands! Thanks for the chance. I think Natalie’s book and your fabric are a match made in heaven! Thanks for the giveaway! I love the block with your embroidery and think the book would be so delightful to win! That book looks adorable, thanks for the introduction!! And of course the chance to win. What a wonderful opportunity to win this lovely book and some gorgeous fabric. Thanks for having a giveaway. I love to embroidery and patchwork and Natalie’s work is fabulous. Thank you for the chance. So bright and cheerful!! Gives me a happy feel. Wow looks like a gorgeous book, definitely on my “can’t live without” list! Some people call me small & flat ;) Such an adorable book & of course would love some Mochi! I love combining a little patchwork with embroidery for a modern twist! Thanks for giving us a glimpse of the book. I’ve so admired her work for a while. Hope to win or I’ll just have to go out and buy it myself! I love Natalie’s designs and this book looks fantastic,thankyou for a chance of winning one. What a wonderful giveaway. I love all of Natalie’s creations. You’re so lucky to be related to such a talented girl! I havent done any embroidery in years….but I’d love to get back to it. this might just do it. I LOVE your new fabric line too. Oh, I so hope I win. Natalie’s new book is just gorgeous, and the YUM YUM yummy fabric is sooo good. I have a Flat Nat and I love Natalie’s patterns. I would love a copy of this book and I adore your fabrics so the added bonus of the fabrics would be divine. Love what you made with the Cosmo threads. consider me charmed and fascinated! I love Cinderberry! Nice giveaway anf photos! Oh, these things are so cute. I hope, I also can buy the book and the fabrics here in Germany, if I will not win. We Love Natalie here in OZ…Those Gorgeous Fabrics look right at home with one of Nat’s drawings & those Cosmo Threads look just Beautiful.. I had not heard of this book yet but it looks FABULOUS! Going to check out more of her creations - thanks for sharing! Such a fantastic giveaway! My hands are itching to start some of the stuff immediately! Hope I’ll be the lucky one. Natalie’s book makes me happy just looking at it. Thanks for sharing your review. Awesome, I love both of your site’s they are so colorful and HAPPY!!!! I love to win a copy of her book, I have been reading her blog for some time now. What a great giveaway! The quilt is gorgeous and the floss looks scrumptios. Please, oh please, pick me! I love to embroider and have been reading her beautiful blog for a long time (thanks to you Monica). I have a Flatt Matt (aka Gnoma Klaus) and would love to make a Monica/Natalie quilt using inspirations from you both. I think that if I win, my fiance might not speak to me for awhile, seeing as how I’ll be spending all my time stitching. That is the cutest book! and I love your fabric so much too!! Adorable sewing room! Thanks for a chance to win. Beautiful stuff! Summer is a great time for embroidery projects because they’re so easy to take along on trips. My QBFF absolutely loves those little mushrooms. I would love to win the book, just so I could make her one for her birthday or for whenever! Everything just looks so dang pretty! What a cute book! Love how the pattern compliments your fabric so well. OOOOOOHHHHHHHHH this beautiful book of Natalies looks amazing & what gorgeous yummy,funky fabrics too….. Your fabrics are so buoyant, bright, and beautiful–they make me feel happy every time I see them. And Cynthia’s designs are so incredibly sweet. Thanks for the chance to win some! So cute! I’m happy to know about it! In the land of new embroidery designers, Her designs appeal to me the most! Love the color for your embroidery piece. I learned to quilt with my nonna many years ago (still have those pillowcases). . . as I head into a partial early retirement, I would love to start again. This book looks amazing! And I’m super excited about the Mochi fabric line too. The book looks lovely. I think the 4″ block you made is really sweet too. Thanks for the giveaway. Love the floss projects! I learned to embroider at a very young age, and love handwork. These designs and fabrics bring new life to that old craft! 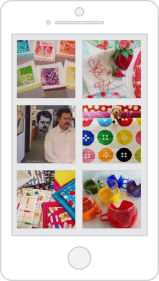 And congrats on being named to Quilt Home’s Top 55 blogs list! Hmmm had to add while I too love having more street lights to read and sew by while driving since i have moved to NM where we have light ordinances to keep the skies darker I have never seen so many stars in the sky its sparkly and amazing to see, I could stare forever…maybe even see the TARDIS flying by! Hi Monica! Not here to comment so I go into the draw to win the gorgous Cotton Floss…just here to say you have kicked off the tour in colourful style and I love your yummy fabrics! That sleep over idea sounds great…anyway of organising it for real??? oh, the book has so many lovely projects (Natalie is lovely too). I’d love to have it and the fabric from you makes it all so much more special! thanks for the giveaway from you both! I’m just starting to get into embroidery and could use all the help, guidance and inspiration I can get! Thanks for the giveaway. This is an AMAZING giveaway! I was so excited for the magazine and then your freebies added in too! Oh please pick me! Flat Nat is just so adorable, but you’re right everything about Natalie is so cute. Her designs are so cute and pretty. And your fabric just complements it too. Natalie is one of my favorite designers, fantastic book! I have been anxiously awaiting the release of this book!! I LOVE Natalie’s stitcheries and have quite a few of her patterns. She is such a talented designer! I would be thrilled to win her book and a little taste of your new fabric!! I would soooo love this book - such gorgeousness!!! thanks for the chance to win!! What a gorgeous book! I don’t embroider (yet) but have been wanting to learn! What a sweet looking book and projects! I’d love to win! Oh, my goodness! Please pick me! I’ve been looking everywhere for that book and nobody seems to have it yet!! (Also, ditto for your fabric!) Gorgeous, gorgeous, gorgeous! i stalked you all the way to the lecien site one day and found a super-cute embroidery called flower girls; now i stalk natalie too! The colors, the threads! I am just learning to embroider to accent applique. Please pick me, I will give the book a happy home! Oh, I want this book! Love her and her work! Would be fantastic to win and add her book to my collection! So adorable! I love all the red and blues. I love the look of combined patchwork and stitchery. The giveaway is made even better with the addition of the charm pack! OOHHHH what fun! Ooh, that little mushroom makes me smile! I bet this book if filled with so many cute projects! Came right over from the Cinderberry blog. Have been a follower for a long time; love Natalie’s work and would love to win a copy of this book. And fabric too! Both too cute. So sweet! Lots of fun to be had. Thanks for the giveaway. Book looks great and love your fabric…Great giveaway…hope to win! Swooning from the cute! What a most excellent giveaway! Applause, applause…. I love Natalie’s work and would love to be the recipient of your wonderful give away! Pick me pleeeze! It looks soo fresh and bright…really has my crafting juices going! What a wonderful new book! Such happy colors and patterns- I could lose myself in these projects for months!!! I love Natalie’s patterns it would be so fun to get my hands on her book. And to get my hands on some happy mochi yum yum. Thank you! Oh how I would like to win this. I’m on book restriction until fall, and will be definitely be pouting until I get a copy of this! What a cute giveaway! love it! I love Natalie’s stuff and this book looks amazing. Such a cute book! I would love start doing more embroidery, this book looks awesome! Hi Monica. What a great post and looks like a MARVELOUS book. I’d love to win it! 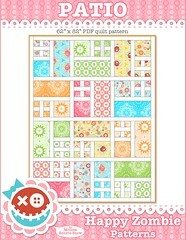 You little Flat Nat quilt is darling! Oh, just looking at all the colors makes me smile! Thanks for the opportunity to win. Love looking at Natalie’s blog and would love to win her new book. Many thanks for your very good review. Hugs from New Zealand. Oooh…I keep seeing this and I’m trying to figure out how to get my hands on a copy of this!!! If I’m not the winner, please direct me to where I can get one!! I have been admiring Natalie from her blog for a few years, can’t wait to see her book! I love these little guys, especially the owls since my little one is obsessed with owls right now. Love it…Love it…Love it! The 11th was my birthday and I think that would be a great birthday gift for me ;) ;). Even if I don’t win, I think it will still have to be a birthday gift for me… from me! So cute! The book peeks are really inspiring me to get stitchin’. Along with the other things, like some of your fabric? I’m standing in line. It’s like Christmas in June to see this giveaway! I love everything about it! Thank you MSS I hope to win…if not, well next purchase! Seriously coveting that Mochi goodness too! I just love the pics from this book. I haven’t stitched for quite some time. If I don’t win this book I know for sure I’m gonna have to buy it. Your stitiching looked wonderful with your fabric. Thanks for sharing!!!! Oooo….I need those mushrooms all over my house. Or do I need the owls? Or do I just need it all?? What a sweet..and positively addicting…little book. Many happy hours spent between those pages! Thanks for sharing! I love owls and the other projects are adorable. I will learn to embroider, I promise! I am loving all the cute owl projects in those photos! Looks like an adorable book! I’m in complete adoration of everything Natalie does–I cannot wait to get my hands on a copy of her book! *crossing fingers* Thank you for the fabulous opportunity!! What!!!! Best giveaway ever!!!! thank you Monica & Natalie!!!! How exciting…I’m obsessed with the little owls! I want to stitch a little gang of them!!!! I just learned to embroider. This book looks fab! I definitely have someone small and flat in my life! Oh, do you want to know who? Well, I’d love Natalie’s book and some of your Happy Muchi Yum Yum of my very own too! Cotton Floss looks like something I’d really enjoy. Thanks for featuring it since if I don’t win, I now have a new “must-have” book to add to my list. Wow, this looks like everything I love all in one spot! I’d love a chance to win, please toss my name in the hat for a chance! I’m so in love with this book! And your fabric. This would make my year to win this one! 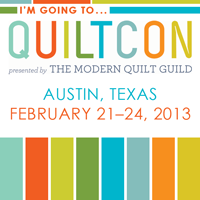 Gosh, just discovered your blog through Kim’s Big Quilting Adventure and I love your aesthetic! I would like a chance to win too, pleeeeeeeeeeeeeeeeeeeeeeeeease. great giveaway I would love to have a good look at this book. Fingers crossed I would love to win this. So freakin’ cute. Come’on random number generator!!! Love it! 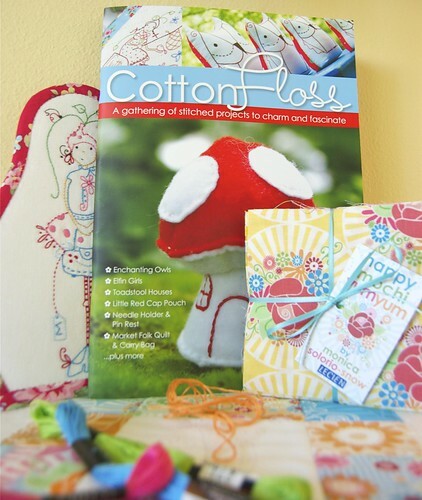 I’m craving some of that floss…and the book and your fabric…thanks for a chance to win! 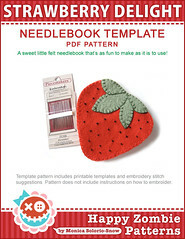 I would so love this book…..I haven’t been able to find it in Canada, and love to embroider and make small projects!! Yes, Natalie is adorable. So are her designs and I love the name Happy Mochi Yum Yum!!! How fun is that?? I love your block and I need a Flat Nat of my own. My sewing room gets kind of lonely sometimes. I imagine Nat is a great secret keeper as well. OMG, I totally have to go and get this book. Like you, everything in there just screams “just for me!! !” And your fabrics are absolutely delicious. I love them all! I am so thrilled with all the play that embroidery is getting lately. Thanks for a look at the book and for the chance to win it! Oh, please let me be the winner of Nat’s book! Her designs are what inspired me to start embroidery!! Combine those designs with your fabrics, oh delish!! Please, please random dot org, pick me!! Thanks Ladies for this opportunity!! Oh, dang, that stuff is CUTE!!! Thanks for the contest! Such cuteness! The book, designs and the yummy fabric~ Thanks so much for hosting and the give-away! I love Cinderberry Stitches. I wish her patterns were more available in the U.S. Thank you for an opportunity to add “Nat” to my sewing book shelf. Oh my, so much cuteness! I’m in love. :) Thanks so much for the giveaway. Natalie’s patterns and your fabric line go together perfectly! Such sweetness coming from the book. I could just hug it! I love embroidery, so glad to hear about this lovely book! Looks so cute! Thanks for the giveaway. Love it!! So dang CUTE!! I need a dose of cutesy inspiration so PICK ME! I love the fabrics and colors you’ve chosen for the Natalie’s design!! Ohhhh, it looks awesome! Can’t wait to flip through the pages of it! I love Nat’s work and Cotton Floss! And I just discovered the fabric and think that’s amazing as well. The little mushroom is adorable, and so is your embroidery with some Mochi Yum Yum surrounding. Flat Nat is such a lovely companion, she probably deserves some Mochi too. Thanks for the chance to win some of my own! What a great book. Can’t wait to see it in person. Flat Nat’s Needlebook Suitcase is totally over the moon. Guess if I don’t win I will be buying this batch of goodies. How much fun could I have with this book and fabric???? I SO want to win this book. Things have been a little tight here in Michigan and stitching has kept me sane! I would so love to branch out and try my hand at embroidery! Thanks for the awesome giveaway! Oh wow I love all the Cinderberry Stitches stuff! I would love to win her book. If I don’t win I will definitely be buying it though. Thank you so much! what a bright and cheery book and style! I’d LOVE to win! What wonderful projects! My imagination is running with ideas! I have a couple of mushrooms as part of my living room decor and the mushroom in the book would fit right in! love her work - the book looks fab and I will be buying a copy if mr. random number generator does not pick me! I LOVE Cinderberries. these pattern so tickle my fancy. I would love to win a copy of her new book. Thanks for doing this. I would love go win this darling book! I already have the book but one copy signée is better !!! 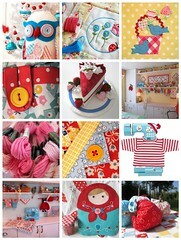 And I definitively love your happy mochi yumyum Fabrics !!! LOVE the book! Happy Mochi Yum Yum is a perfect pairing with the designs. Wow, that looks amazing. It’s been years since I’ve picked up floss and needle which is sad because I used to own a cross stitch shop. I’ve always admired Nat’s work!!! Her designs are just charming~ I’m truly happy to see her first book, and of course would like to win one!!!! Thank you so much for this opportunity!!!!! 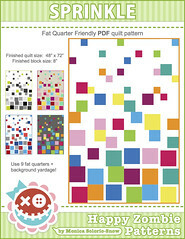 Love Cinderberry Stitches designs = I’d love to make some projects from this book, especially using such happy fabric! It’s all so adorable and happy, I would love to win! Looks like a wonderful book and I love your fabric line! Flat Nat has the most adorable face ! I love natalie”s work,so this sweet book with mega cuteness thinks it wants to come to my house,pop right up on my book shelves to be prominantley displayed amongst my other inspirations! Your fabric is soooo HAPPY! I love fabric,probably a little too much!!!!!! This looks like a great book. I could use some new ideas! oh my goodness! What an amazing book!! And what an amazing giveaway! Cotton Floss looks like the cutest book ever! Thank you for giving us a chance to win one of those scrumptious books!! So cute! As someone who is learning embroidery, I’d love to see this book! i want to live in her studio. seriously sweet. thanks for the chance, love to get my hands on this book and some happy mochi yum yum too!! I have been eyeing this book for quite some time and it just looks too fun. I love embroidery and felt and this book seems to deliver! Oh oh oh! I sooooooooo hope I am the lucky winner. The projects in the book are too adorable, and I would love to get my hands on that charm pack! Thanks for sharing! Such a fun looking book with great yummy colors!! I LOVE it!! All soo cute!! I LOVE the book and I will just love to get me some YUM YUM! And Natalie? She’s just as beautiful as her book. Thanks for the opportunity to participate in your giveaway. What a cute book. It went straight to the “gotta have it” list! Very, Very cute!! I think it wants to come home with me!! Hi travelled over from Amandas blog - will be exploring yours a little more today! Love the pics from Natalies book - would love to get my hands on it. Love it! Love, love, love the book and Natalie’s enchanting designs! this is so perfect. It suits your blog too, like strawberries and cream. Those projects look so cute. I’d love to get a copy of the book. Fingers crossed! Throwing my hat into the ring for that wonderful stuff! Love your blog! Wow, that looks excellent. I’ve just started getting better at embroidery so having some fun new projects would make me very very happy. Wow what a great prize. Love the cute sticheries,Congrats Natalie! ADORABLE! I would love to win. Thank you! what a fantastic opportunity. I love the look of everything you’ve shown. what a fantastic giveaway — please count me in! i love to embroider, it’s very relaxing and comforting! Oh my gosh that’s totally awesome! What a groovy book. I’ll have to take a look! This book looks so cute! Can’t wait to see this and your fabric. A zig zag quilt is on the horizon. Natalie’s book look really lovely. I love the colours you’re using on your quilt. Too cute. The giveaway is awesome! I have been following both your guys’ blogs for a while and would love to win this!! What a great giveaway! I’ve just started hand embroidery again after many years of setting it aside. This is truely a treat! Oooh, I’d love a copy to get me inspired to stitch! ooooh! so cute! Thanks for the chance to win! Love, love, love this book and your fabric is just too yummy for words. I have so enjoyed reading your blog and will continue to do so now that I have found you. Be happy! I can’t wait to get my hands on this book! Everything about it is just calling my name. Thanks for the pics and great review. This book seems full of beautiful colors, so lovely! How sweet! Thanks for the give-a-way. i love your web site. Thanks for the give away, such a wonderful book…I would love to make some projects from the book, too. BTW when is your happy moshi fabric coming out? It looks like such fun! I haven’t stitched in many years, and I really want to…especially w/all the cute patterns & gorgeous colors I keep seeing. I just have to squeeze in a few more hours in the day…Maybe I should cut out sleeping?? Thanks for the chance to win an amazing prize! What a gorgeous book and I love your stiching. Wouls be so happy to win and make something equally as lovely. Thanks for the chance! So so cool! Thanks for the chance! The projects look like a lot of fun and I love Happy Mochi Yum Yum. Mochi and fabric - two favorites! Cheers! I love it! The colors of your mini quilt are amazing. So cute! This book looks awesome, too. Love the mushroom! I LOVE Cinderberry Stitches! I have a wall-hanging (on my wall!) that I finished a couple of years ago, and I admire it every day! I would love to win! This looks like a great book! I read Natalie’s blog and I am in awe of her talent. So you’re saying I should try Cosmo floss, I take it? But what will I do with my million DMC flosses? I know, DD and I can make friendship bracelets! 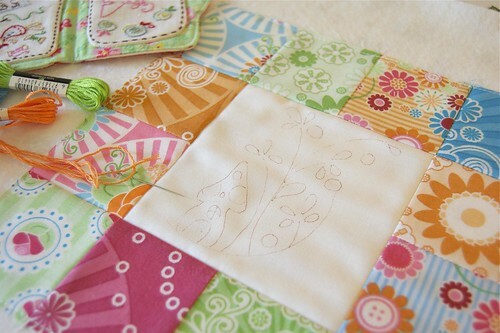 :-) I’d love to make a mini quilt with your fabric first!! Love the projects and COLORS!!!! Wow! That is too cute!! Her stitcheries are wonderful and love the ones from the book, so fun and great gift ideas too. Really great looking book and I love the fabric as well. Makes me wish there were more hours in each day to sew - so cute! Beautiful! I love your quilt for Flat Nat and I love your fabrics. I like the colors you used especially, my favorites. Thanks for the chance to win! What a cute book! I’d love to get more into embroidery! this book is gorgeous and I love your new fabric line too - please enter me! The garden gnomes and Tomtens are tap dancing through the woods to enjoy these petite treasures in colours so yummy you can taste them! Oh my goodness, that is so cute! I love that mushroom and all that red! I just started redecorating my studio to make it look cleverly coordinated rather stacked and cluttered, and some cleverly put together mushrooms would probably take it to the next level! ;) And of course the Happy Mochi Yum Yum is (imagine high pitched singing) AWESOME! Great book, great lady, great patterns=would love to win a copy of the book=very happy. I have followed Natalie’s BLOG for as long as it has been a blog and met her in sunny (rainy that weekend!) Queensland!!! I would so love to win a copy and play - just for therapy?…. I love the book, thanks for the chance! A lovely book. Thanks for the chance to win a copy. I am enjoying the interviews too. I’m always adore the color of your works. The fabrics yumyum looks yummy. This looks so delightful. I am jealous of Natalie’s workspace- so bright and airy. This is so lovely! All the images are great. This book is definitely going on my wish list. It looks gorgeous. My daughter & I have been eyeing this book! It would be awesome to win! Love the Happy Mochi Yum Yum block. What a combo: Cotton Floss and Happy Mochi Yum Yum! I know there’s a site called Cute Overload, but this could steal their thunder. It would be the ultimate in giveaway goodies. Love it all! these are so adorable. Please count me in. Please please please, may I ? Love book cover already! love cinderberry stitches. ooh please pick me!!! What a beautiful book….yet again…your designs continue to trill a crafter like me !!! fingers tightly crosssed, you never know! I’v just started to get back into embroidery and would love to win this to help ‘jazz up’ my quilting a bit. Thanks for the chance. what a cute book. Thanks for the chance to win! I love Natalie’s work! Your fabric looks gorgeous too! I can’t wait to check out the book when I get my hands on it - one way or another! 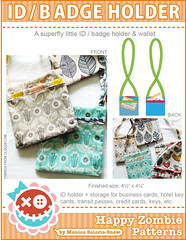 Love your fabric, love her book - a chance to win both would be fabulous!! Thanks! Would love to win, of course! :) Looks like a great book. Oh man what a great giveaway! I am a huge fan of embroidery and of course your fabric is divine! Thanks so much! Great giveaway! Thanks a lot for the opportunity! I would love to win either the book or the charm pack. To win both, a dream! Everything Natalie designs is so cute. She is a very talented woman - and so are you Mrs. Zombie! Natalie’s designs are just so cute and it would be wonderful to have her gorgeous book. I have a few granddaughters that would love me to make some of those cuties. this book looks great! so cute and colorful. Love that little mushroom! Would love this book! So many cute ideas! She’s very talented…thanks for the chance to win the book - not to mention your fabulous fabric too! Awesomeness……piece. Oh my that looks like such a sweet book! Her work is great! thanks for the giveaway! So cute! We don’t have a Nat, but my youngest has a little doll named Dotty who would LOVE a Mochi quilt with some pretty stitchery. Thanks for the chance! I’ve just started a quilt along that includes embroidery and I am so excited about it. This book looks awesome too! oh how cute! I need to incorporate some embroidery with my sewing, it’s been so long since I have embroidered. This book looks like a lot of fun, just like you fabrics! will have to check it out - thanks for the chance to win these yummy goodies! Thanks for the chance to win such a lovely book. I always look forward to reading your blog! Oh, what deliciousness! Thank you for having this giveaway — and thank you, too, for your wonderful photos! Too cute! oo. oo. me. me. me. Just getting started with the whole sewing thing and LOVE all the inspirations! Thanks for the opportunity! Thank you so much for allowing us to win! I love both your fabric and Natalie’s book! Weeping from the loveliness! Awesome book!!! these are SO cute! i just started to embroider… i could make a bunch of these goodies for christmas presents! and I LOVE your fabric too. how do i not have that already?! Oh I so need this! I love it. pick me please. What a colourful blog post :) Great! This book looks so cute!! I love your new line of fabrics too! oh my! I would so like to win - just ONCE! This would be a dream! That little toadstool house is so cute! I want a village of them! Natalie is so talented! I would love to win her book!! Although there is no Flat Nat in my life, I’d happily flatten a passing Natalie to get my hands on this fabric and wonderful book! I have yet to do freehand embroidery but I do love cross stitching. I love the colors you matched with the Happy Mochi Yum Yum patchwork. Your work is so beautiful, colorful & whimsical, I love it! I do lots of hand work & currently working on 4 different projects. I would love to win something new & different. Great book. I too like her work and patterns. Beautiful job! I love embroidery and your combination is fantastic! Thank you for the opportunity! Wow! a match made in heaven…this book looks amazing. 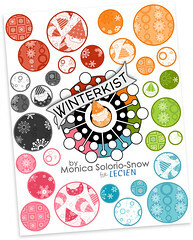 Hi Monica: I just love your new fabric line and the Cinderberries designs would go wonderful with it. I just love her designs but they are very hard to find where I live. I usually have to mail order. Love you blog and your designs! And, it’s so difficult to find your fabulous book - hope I win! I’ve never entered a contest before. But I love Cinderberry Stitches! You are right - she is so talented. I like the fabrics you used around your Flat Nat. So cute. I love Natalie’s quilts/designs. Her Tail Feather’s one is still my fave though. Wow, the book looks absolutely gorgeous and so does your fabric. I don’t know if this is open to international comments, but I would LOVE to win! I’m smiling so big it hurts. This is the most adorable blog ever. Natalie and her space are both adorable. I love the colors, and the mushrooms, and everything. Great giveaway. Oh My Goodness…just when I thought things had to calm down for awhile. Another project I just have to do! Pick me, please? Wow the book looks so interesting and inspiring! Beautiful! Love the designs, love the floss and, of course, love your new fabrics! Oh, what a great book! And I do love the Yum Yum fabric! Thanks for the chance to win. What fun! I just love the color combo of teal and red, it just pops! “Cotton Floss” is so lovely !! I’d like so much to win a signed copy !!! Wow ! Yum Yum fabric and a cute new book in the same giveaway ! I might just squeal out loud if I win !! I used to embroider all the time and I never would have thought to include it in quilting. Thanks so much for introducing me to this charming book. My niece loves toadstools and would love the toadstool houses. The other projects are quite charming too. I love the colors in your project. The Happy Mochi Yum Yum fabric is adorable. Oh geez, way down the food chain…lol! Love these photos Monica and the designs with your fabric, brilliant! Thank you for the chance at this lovely giveaway! The pics are amazing! What a great pair to draw to! Love both & cograts to you both. Everything is just so so happy and cute!! This is so adorable, but seriously the colors and embroidery all together are just something!! Wow! What a fabulous book! I’d love to win one (and the cute charm pack). Thanks for sharing with us. What’s not to love? Seriously amazing book. And…Flat Nat is definitely the BOMB! This looks so fun! I’m just beginning to brave the world of embroidery w/ quilting - so what a fun book to help me learn! Oh, I am so excited to win this! I follow Natalie’s blog also and would love to get my hands on her book. Thanks for the chance to win! This book looks wonderful. I just love to embroider and the designs are gorgeous, not to mention the gorgeous fabric. Thanks for a wonderful giveaway. How cute are those patterns!!! 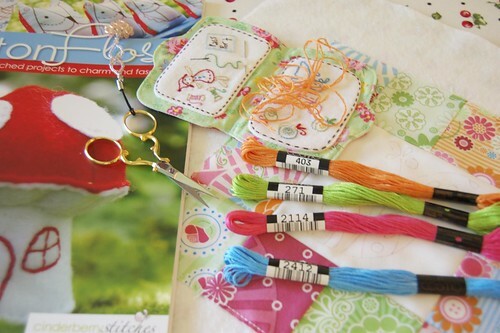 I love stitching…thanks for the chance to win the book and fabric! The book looks very cute, I love the owls and and the beautiful fabric you have used. Hope I win! The book every stitcher should have in her collection. Love the colors, the patterns and the general prettiness, well done Nat. Awh…the mushrooms are sooo cute! It reminds me of smurf houses! Sew Cute! I’d love to win this book and charm pack. It would be sew much fun to stitch. Thanks for the giveaway! love the book and would make a Flat Nat for my grand daughter to take travelling. I want some COTTON FLOSS/ YUM YUM!!!!! !I want it all. How precious! Good Night! The Colors of the floss make me want to eat them………….and oh, the fabric you are using. I want some too!!!!!!!!! Hope my name gets picked. Thanks Monica for getting us all psyched!!!!!! Happy days are here again! I love Nat’s work…she is amazing. My fingers are double crossed for this one. The book looks like so much fun! The fabric is great too! Thanks for the awesome giveaway! I would love to win the Book and the fabric! What a cute book. 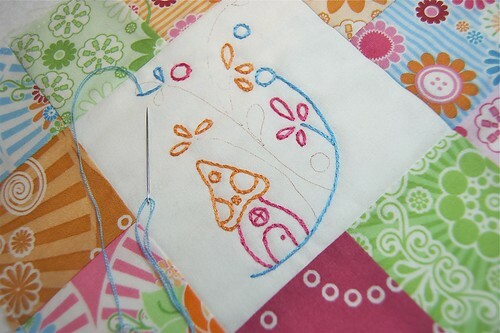 I love to embroider and have been trying to include some stitching in my quilts. I haven’t tried the cosmo floss yet but it sounds wonderful. The book has the cutest projects ever. I’d love to have a copy to make some of the projects. Love it!!! Thanks for a chance to win! That book looks so cute. If for some reason I don’t win, I am definitely buying a copy. Your block is so adorable! It’s amazing how fast you can embroider - and in a moving car no less! I’m most impressed with your skills. Count me in! I love mushrooms and not just on my pizza! The embroidery is SO cute! I love the colors used to match the fabrics. Just cute as can be! I love this book and I’m obsessed with embroidery…. please let me be lucky here!!! Natalie is so clever, I’d love to win her book. Thanks for the chance. First time visitor and oh my goodness, do I love all the colors on your blog! The book looks amazing, just what I need to get myself back into embroidery - been meaning to do that for a long time! I love the way you combined the book and fabrics in your little block! This looks so cute! Thanks for sharing the book! It looks like a great book, and good timing since I’m on an embroidery kick lately! oh how exciting!!! I would be most grateful if u picked me!!!!! Looks so cute…embroidery is my favorite pasttime - would love to win so toss my name into the hat. Now what is this Cosmo floss? I need to try it. WOW, pick me, pick me. I love Nats stuff and have been eyeing your happy mochi yum yum since you announced it here…. Thanks for the giveaway! The embroidery is super cute and of course your fabric is fabulous. And of course, I can’t wait to see Natalie’s fabric line in the fall. Thanks again! Lovely bright photo’s. Thanks for the chance to win a copy of Natalies book. I’m so impressed with the cute designs. So in love with it. Can’t stop looking at this fabilous new book!! I’m obsessed with the owls in this book and would love to win it! Looks lovely, please count me in, thanks! i really like everything Nat doing…it’s so beautiful and amazing…^^what a surprised giveaway…Thanks..
but the shop in the U.S don’t ship to me. So where should I get it? Happy Mochi Yum Yum is SUCH a great name! And the woodland cute ness is fab. The patterns in this book look adorable! I do love the colors used in Cotton Floss. Natalie does GREAT! would be great to win a copy. thanks for chance. Looks like a great combo, book and fabric! Cute. Cute. Cute. Everything looks so yummy! Can’t wait to get a copy of the book. Love your fabrics too! Looks like a wonderful, fun book! Beautiful fabrics and great looking project! The book looks fun too! Love this book and can’t wait to get it. Natalie’s patterns are adorable. I have to get that Flat Nat pattern too! I want this book so much… Everything looks so fun! Thanks for the giveaway. Looks like a great book!! Thanks for the opportunity! first time at the site and i love it! can’t wait to look around for some inspiration! BTful vivid colors!! I could stitch such wonderful designs!! Oh gosh, I am aching for this book. And that charm pack is the icing on the cake! Thank you! Natalie’s designs are just too darn cute. I love this book!! The mushrooms are just too sweet. Thanks for the chance to win!!! The designs in this book are too adorable! Thank you for the fabulous review and giveaway! Love the fabric and the book is soooo cute. Oh, I love Flat Nat. What a lovely book. Thanks for the chance to win a copy! I love how whimsical it all looks. So fun. I learned to sew in Australia as a kid and I just love these Aussie designers! Oh yes please! Love love love your fabrics in the mini quilt! I’m truly in LOVE with that little Toadstool House and Happy Mochi reminds me of the short and wonderful time I spent in Japan. Will you please share where you got the cute needlecase shown in the pic of the Cosmo floss? Thanks for the chance to win! That book is so cute!! I love it! I would love to have her book and your fabric. What a treat! I cannot tell you how much I LOVE these colors - they are just sooo happy and cheerful! How lovely! Love the colors. I’ve recently rediscovered embroidery. so relaxing in my hectic life. I can’t wait to get this book & start stitching & would love some of your fabric to make some of the projects in the book. Love, love, love the block! I would love to win! What a great looking book! I’m new to embroidery and cant’ seem to get enough. I’d love a chance to make some of these lovelies! I would love to win this book and try a bit of embroidery for a change! I love Natalie’s embroidery. 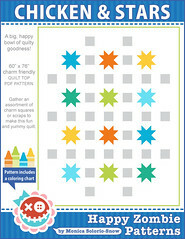 And your Happy Mochi Yum design is just perfect for combining both quilting and embroidery. Awesome! What a great prize combination. The book looks fabulous. Love those little toadstools. What great colors and cute pattern! Love the floss. Want. the. floss. Thanks! I am in luck. 460 is my lucky number… Pick me! Wowza! This looks amazing! I need a copy for me and my mom! Must go check it out, thanks!! Just found your site. Love the colors, fabrics and Cotton Floss book. I too hand stitch a project while traveling but i usually stop at dusk, needle pricks run rampant with me! OMG. I hope 463 is a good number. I seriously need an airplane project book! love your bright version of the embroidery and your fabric is so delightful! Would love to win and thank you for sharing additional stuff! much appreciated. Would love to win the book and fabric…I love your fabric! Wow, what a fantastic book. I would love to win! And how generous of you to throw in some fabric to get started right away! Love those projects! Thanks for the lovely give away! thank you for this chance wow!! So cute! I have a clip on light for my hoop. LOVE it. Had to have it when I was in the Navy. Love the badge. Need, Want, Love, Yummy Gorgeousness! Would love to win Natalie’s book. Her designs are so colorful and cheerful. And I just love your new fabric line, Monica! Loved your interview with Pat Sloan, too! Oh how I would love to win this book. I love it! At this moment I do not embroider. This looks like the book I need to get going. Love the thread too. OOOOOHHHH, how I would love to win that book, it looks yummy!! !